Photos from the Art of Research contest are featured in a travelling, pop-up photo exhibit currently being held on the first floor of Stauffer Library. New building banners highlighting Queen's research were recently placed on prominent buildings, including Stauffer Library and Grant Hall. A series of four pennants, featuring photos from the Art of Research contest, adorn the light posts along University Avenue. Every day impactful, cutting-edge research is being conducted at Queen’s and the university wants everyone to know about it. Enter a new multi-faceted campaign on campus aimed at promoting and celebrating the groundbreaking work of the university’s researchers. Other building banners and light pole pennants around campus are highlighting a pair of celebrations – the 50th anniversary of the Faculty of Education and the 125th anniversary of the Faculty of Engineering and Applied Science. At the heart of Queen’s, building banners celebrating award-winning research don Grant Hall and Stauffer library. Pole pennants have also been installed on the light posts along University Avenue, featuring images from the Art of Research photo contest. Each year the popular photo contest provides faculty, students, alumni, and staff the opportunity to showcase their research, scholarly, and artistic work. It also provides many amazing photos. 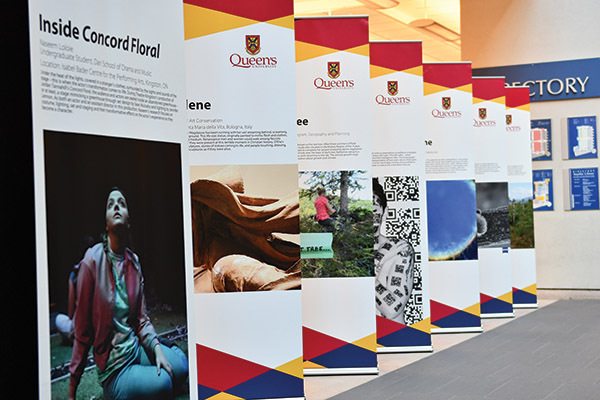 Together, the new banners cover a wide array of research – from arts and humanities to physics to cancer and health sciences to biodiversity and climate change. The first image, Santa Fina, was taken by Una D’Elia, a faculty member in the Department of Art History and Art Conservation, at Musei Civici in San Gimignano, Italy. The striking image shows a marble bust of a saint by sculptor Pietro Torrigiani, a competitor of Michelangelo. The second image, Leaving Home, features a spheroid of cancer cells embedded in a 3D protein matrix as seen through a microscope. Taken by Eric Lian, a PhD student in the Department of Pathology and Molecular Medicine, individual cells can be seen radiating away on all sides. The third image, Razorbill, was captured by Brody Crosby, a Master’s student in the Department of Biology during fieldwork on seabirds in Witless Bay, Nfld. Mistakenly assuming the approaching researchers were its parents, the razorbill chick is captured as it begs for a meal. The fourth image is a rendition of the universe, and captures the work of researchers elucidating the fundamental building blocks of the universe, shedding light on things we cannot see. The Art of Research is also being featured in a travelling, pop-up photo exhibit currently being held on the first floor of Stauffer Library. Offering a large selection of photos from the last three years of the contest, the exhibit highlights the diversity of research happening across campus. The photo exhibit will subsequently be on display in Grant Hall for Homecoming, Oct. 19-21, and then in the Lederman Law Library, Oct. 22-Nov. 5. The exhibit is also available to campus partners throughout the year for events and display purposes. For more information on research at Queen’s or the Art of Research photo contest, visit the website.